In 2009, I was offered the opportunity to be part of the newly-created Hospitality division here at Miles. I'll be the first to admit I was skeptical. After 13 years creating websites and online marketing programs exclusively for DMOs, I spoke content strategy and SEO, not ADR and Rev-Par. Turns out, that didn't matter. Because for millions of travelers, the resort is their destination. Yet resorts rarely take the opportunity to market themselves like a destination. Traditional resort websites are all about selling the room and the facilities. Sure, they'll throw in breakfast or 30 minutes on a paddleboard, but the breakfast buffet probably isn't why you are looking forward to your vacation. Resort websites tend to focus is on targeting the travelers who have already passed dreaming and are into the practicalities of planning. Did you know that "SNUBA diving" and "bonefishing" have more searches and are less competitive search keywords than "Florida Keys resort?" Room sold! – by leading with the travel dreaming instead of the travel planning. Imagine this: More than anything, my husband wants to go tuna fishing in the Keys for his 40th birthday...big boat, feisty catch, fresh sashimi. 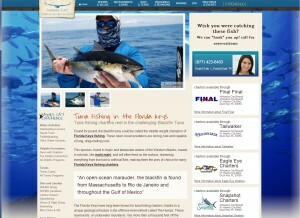 I go to Google and search "Florida Keys tuna fishing." On the first page of results, side-by-side with the TDC and some local fishing charters, I find Hawks Cay Resort. Not only do they have great information on tuna fishing (apparently we need to go to "The Humps"), but the fishing is tied to a property that also has villas for our friends, a pirate pool for the kids and a slew of other activities (and a tiki bar). Room sold! – by leading with the travel dreaming instead of the travel planning. 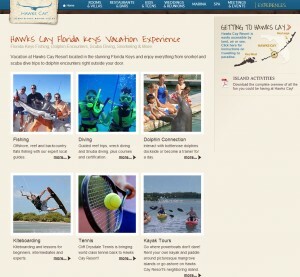 Check out the rest of the newly enhanced Experiences section of the Hawks Cay Resort website. In just the first few weeks, 33 of our targeted SEO keywords have moved into the top 20 search results on Google. Photos of today's catch are being uploaded straight from marina-to-website, and blog posts come in regularly from dive captains, dolphin trainers, tennis pros and more. A Sarasota native, Kim came to Miles as a college intern in editorial in 1994 and stuck around to develop some of the company’s first destination websites in the late 90s. She is currently the Director of Online Marketing for our Hospitality division, where she develops and implements the online media, SEO and content marketing strategies for our resort clients.